this is a simple and quick recipe which is so convenient in the sense that it can be a side dish for everybody else in the family, while the person on diet can take it as a main dish along with palak wali daal or something like that.........it is good with my multigrain chapatis. microwave the tomatoes for 2 minutes on high, alternatively pressure cook them for 1 whistle. 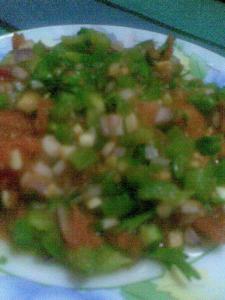 put in the chopped capsicum first into the hot tomato mixture so that it becomes a bit soft by the heat. 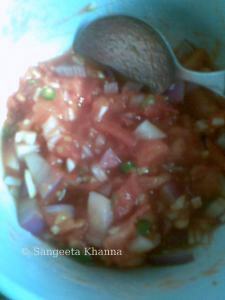 then mix all the other ingredients with a wooden spatula, mashing the tomatoes and a juicy salsa is ready........serve hot or cold..........any way it's very tasty. chutnys everyday subzi/curry for the dieters for diabetics these foods helped me loose wt.